Education in Ecuador is mandatory from age 3 to 18 and is well attended. Those who graduate have opportunities to acquire technical skills or attend higher education to pursue their chosen careers. Education through college comes at no cost to the students of Ecuador. Many families realize that education is important. Families of the children who attend this public school are very poor. Most of them either farm or raise farm animals. It was clear in Ecuador that there is a commitment by the professionals to help students in many ways. They were excited to accompany us throughout our tour. We saw pre-school, primary and high school classrooms. The facility has a library, science labs and a language lab for learning English. The building is handicapped accessible. The administrators take pride in the fact that the school provides many cultural experiences for the children. Since the school is so new it’s the hub of the community, as it hosts markets, fairs and community events. We met with the principal and assistant principal. The preschool and elementary children attend class in the morning while the secondary students attend in the afternoon. The primary language is Spanish. Mandatory, weekly English lessons are given to elementary students for two hours on a weekly basis. English lessons are given to secondary school students for five hours a week. The principal openly expressed concerns. One issue is that most of the furniture is sized for elementary children. Other concerns include a need for teacher training, a better focus on teaching and learning, as well as a need for curriculum materials. He openly asked for support and collaborative opportunities from us. The principal has a budget of $100,000, which does not include teacher salaries. Teachers are paid $820 to $1,120 per month. Unfortunately, free lunch was eliminated due to an earthquake. The school has cement ball fields for soccer and basketball. Some sports teams play against regional schools. The school teams have won tournament. The school proudly showcases their trophies. The interscholastic tournaments and extracurricular activities are limited due to transportation costs. Each class is given a small parcel of land to grow a garden. The school was very proud to have won garden contest last year. There is beautiful mural of the garden made out of bottle caps, which you can see on the back wall of the school. We also visited the school’s small library, and science and language labs. There is a dedicated science teacher to whom classroom teachers bring the children to work on their lessons. Schools in Ecuador have two mandatory state assessments every six months as well as formative assessments. The results of these assessments can change the lives of the children for opportunities will become available for those students with good results. They do not believe they will know the outcome of their students’ success in Escuela guano for at least 10 years due to the longitudinal nature of this initiative. Our visit was most encouraging as we watched professionals from Ecuador striving to provide an education to some very needy children. The students were warm and friendly, and happy to chat with us in Spanish. The faculty believes in their work and it showed. 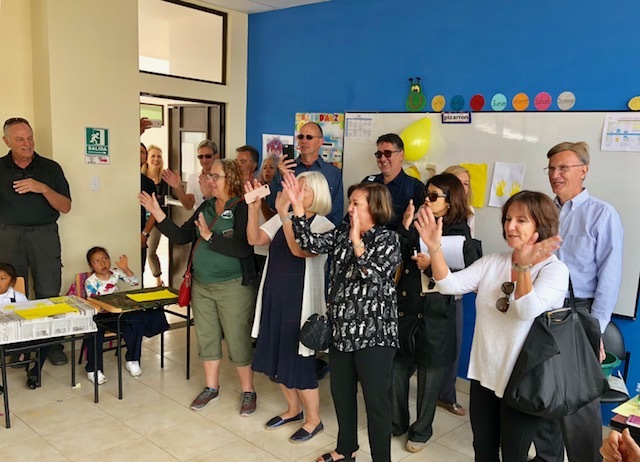 We sadly learned that the new president of Ecuador is not happy with new larger schools and prefers to have small community-based schools of approximately 20 children. This would be a real set back for the public school system in Ecuador. After visiting the Unidad Educativa del Milenio GUANO, we had a short visit to the Unidad Educativa Vigotsky. Given that we had studied Vigotsky during our college years, we were interested to see if the name of the school was using Vigotsky’s theories. The vice principal and the head of the English department answered in the affirmative. The Unidad Educativa Vigotsky is a private school with two campuses located in the Riobamba region. One campus serves the 3- and 4-year-olds through third grade and the second campus serves grades 4 through high school or what the Ecuador education system refers to as the “bachillerato”. The two campuses have a total of 1,100 students and 72 personnel. The school’s tuition is $77.00 per student per month, which seems reasonable to us. Since our time at the school was very limited, we visited a fourth grade class and what we would call a 10th grade class. When we spoke to 10th grade students, we quickly learned they were proficient in English. When asked what their favorite subjects were, the majority of them quickly raised their hands. They asked us what our favorite place in Ecuador was and were quite disappointed when we did not name their hometown. Given that it was dismissal time, we observed family members and school busses picking up the students at the end of the school day. The school day in the Unidad Educativa Vigotsky ended at 12:45. On some days, teachers and other school personnel stay until 2:00 p.m.
Caring adults in both schools. The government provides the students with uniforms at the Unidad Educativa del Milenio GUANO. The physical plants of both schools were in very good conditions. Both schools have happy children, learning what appeared to be grade level material. Educators at both schools seemed committed and passionate about their jobs. We observed large classes ranging from 24-28 students. We all agreed that visiting international schools is so rewarding and reinforces the need for high quality education for all children around the world! Amy Sichel is the superintendent of the Abington School District in Abington, Pa. She also served as the 2013-14 president of AASA, The School Superintendents Association. She participated in the AASA International Seminar in Scotland. Gladys Cruz is the district superintendent and chief executive officer of the Questar III BOCES in New York. This entry was posted in Education and tagged AASA, AASA International Seminar, Amy Sichel, Gladys Cruz, The School Superintendents Association by Dan Domenech. Bookmark the permalink.